In our archives here at TCRC, we have the original LP records of numerous Indian films, right from the 50s to the 80s. 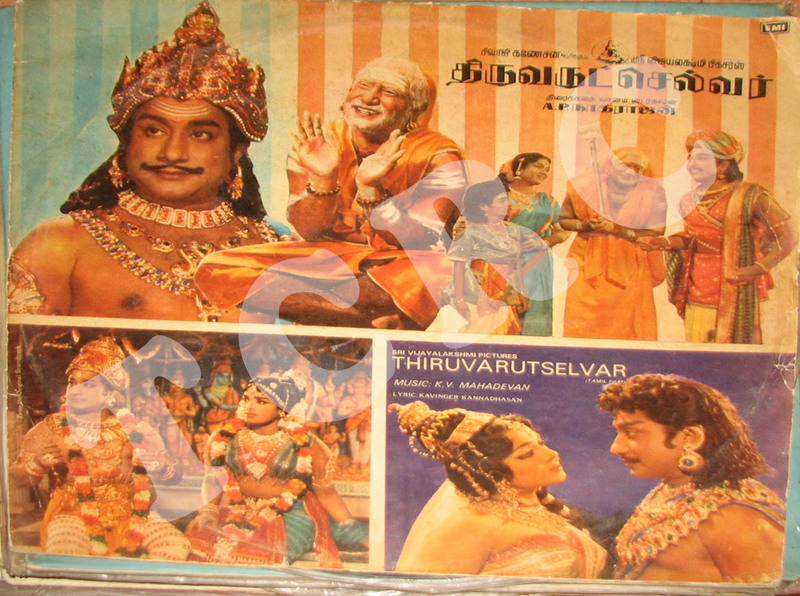 Today, we share with you the photos of the LP record of “Thiruvarutselvar”, a Tamil film starring Sivaji Ganesan, Savitri, Muthuraman, KR Vijaya and others. It was released in 1967 and was directed by AP Nagarajan, the veteran filmmaker whose other hits include “Thiruvilayadal,” “Saraswathi Sabatham,” and “Thillana Mohanambal.” The music for “Thiruvarutselvar” was scored by KV Mahadevan and the lyrics were written by Kannadasan. Even today, one remembers P Susheela’s mellifluous rendition of “Mannavan Vanthanadi,” one of the most popular songs of the album. In an interview with Mohan V Raman for The Hindu in April 2012, CN Paramasivan, the son of director AP Nagarajan had said that the overwhelming response to the re-release of “Karnan” was encouraging him to look into the restoration of some of his father’s films (click here to read that story). We at TCRC hope to see that happen. Also, it must be mentioned here that the same team, i.e., actor Sivaji Ganesan, director AP Nagarajan and music director KV Mahadevan, came together for “Kandan Karunai,” which won KV Mahadevan the National Award for Best Music Direction in 1967, the same year in which “Thiruvarutselvar” was released. This was the first time that a National Award was constituted for the category of Music Direction. Since then, the most number of National Awards for Best Music Direction have been won by Ilaiyaraja and AR Rahman, i.e., 4 each. 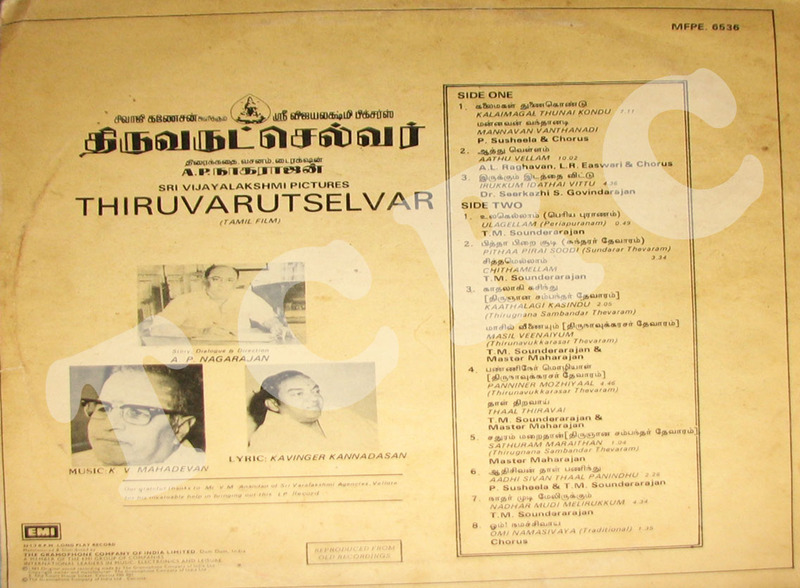 This entry was posted in Tamil Cinema and tagged A. P. Nagarajan, A. R. Rahman, AP Nagarajan, archive, cinema, cinemas of india, Hindu, Ilaiyaraja, K R Vijaya, K. V. Mahadevan, Kandan Karunai, Kannadasan, KV Mahadevan, LP record, memorabilia, music, Music industry, Muthuraman, National Award for Best Music Direction, P Susheela, Saraswati Sabadham, Savitri, Sivaji Ganesan, Tamil cinema, Tamil Film, Tamil Nadu, The Hindu, Thillana Mohanambal, Thiruvarutchelvar, Thiruvilaiyadal, Thirvarutselvar. Bookmark the permalink.